Director/Screenplay – M. Night Shyamalan, Producers – Marc Bienstock, Jason Blum & M. Night Shyamalan, Photography – Michael Gioulakis, Music – West Dylan Thordson, Makeup Effects – Kurt Wunder, Production Design – Mara LaPere Schloop. Production Company – Blinding Edge Pictures/Blumhouse. Three Philadelphia teenage girls are abducted in a car parking lot after leaving a birthday party and then locked up in an underground facility. Their abductor is Kevin Crumb. As they become aware, Kevin has Multiple Personality Disorder with personalities that range from the cleanliness obsessed Dennis, a gay fashion designer to a matronly woman and a young boy. One of Kevin’s personalities messages his psychologist Karen Fletcher, urgently requesting appointments. Through this, she finds that of the twenty-three known personalities that he has, a twenty-fourth, the most dangerous yet and known only as The Beast, is about to emerge. M. Night Shyamalan is very much a love him or hate him director. He has been nominated both for an Academy Award and five Golden Raspberry Awards, winning the latter twice. Shyamalan gained a huge amount of capital with his third film, the huge hit of The Sixth Sense (1999) and audiences followed him through Unbreakable (2000) and Signs (2002). However, The Sixth Sense trapped Shyamalan in an expectation that he would deliver a big conceptual reversal twist at the end of the film. The otherwise worthwhile The Village (2004) ended in a damp squib in this regard and started to turn audiences off in a big way. With the subsequent likes of Lady in the Water (2006), The Happening (2008), The Last Airbender (2010) and After Earth (2013), audiences were getting tired of Shyamalan’s films and he was being greeted with a chorus of boos with everything he put out. To the contrary, I will defend much of M. Night Shyamalan’s work. In a market dominated by endless remakes and franchise films, he is one of the few filmmakers out there continuing to deliver original material and exploring challenging ideas even at his loopiest. However, it was Blumhouse, the company that has given a number of high-profile directors the freedom to make works on economy budgets of only around $5 million, who saw the considerable potential in Shyamalan and backed him with the hilariously weird Found Footage film The Visit (2015), followed by Split, which have earned him some of the best reviews of anything he has done since the early 2000s. Split Personality, Multiple Personality Disorder or Dissociative Identity Disorder is a condition whose actuality is debated in psychological academia. While it was not the first screen treatment of multiple personality, the theme was massively popularised by the based-on-true-life tv mini-series Sybil (1976), which won an Emmy Award as Best Drama and for its lead actress Sally Field. Split personality became a buzzword – and even featured prominently in the real-life Hollywood Strangler case. On film, split personality has a long history that goes back to the numerous film versions of Dr Jekyll and Mr Hyde. It featured without being named in Psycho (1960), which spawned a genre of copycat psycho-thrillers featuring cross-dressing alters such as Homicidal (1961) and Dressed to Kill (1980). The Other (1972) memorably patented the twist of a character being reacted to on screen as being a personality inside someone’s head. Brian De Palma wrought elaborate variations out of the split personality theme in Sisters (1973) and Raising Cain (1992) and there were other such variations as The Love Butcher (1975), Sante Sangre (1989), the absurd Color of Night (1994) and Luster (2010), even a tv series United States of Tara (2009-11). Furthermore, M. Night Shyamalan pioneered a certain type of conceptual reversal twist with The Sixth Sense and a host of films seeking to copy this made a cliche out of The Other trick in pulling back to reveal a character that the protagonist was dealing with was all only in their heads – see the likes of Session 9 (2001), Abandon (2002), High Tension (2003), Identity (2003), Secret Window (2004), Hide and Seek (2005), Martyrs (2008), The Ward (2010), Silent House (2011), House at the End of the Street (2012), Goodnight Mommy (2014) and most memorably Fight Club (1999). 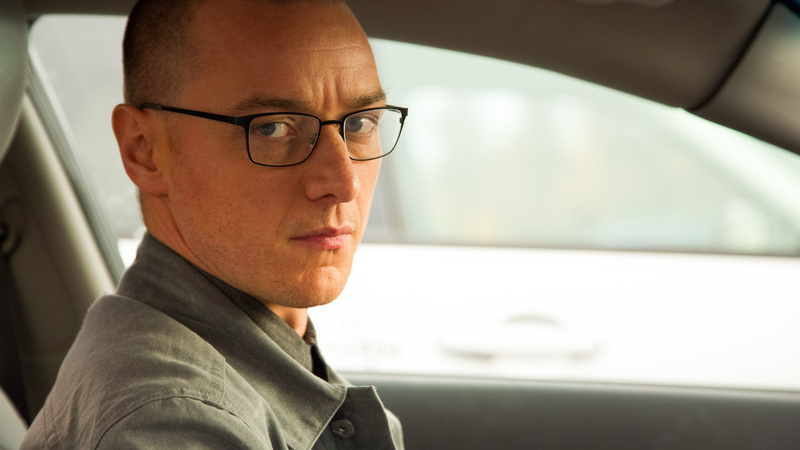 A few years ago, M. Night Shyamalan would have been pressured into building Split up as a big conceptual drama that revealed the existence of characters on screen as alters – maybe something akin to what we had with Identity or Fight Club. Shyamalan is too smart a customer for that and is way ahead of the game. He has taken the brave choice of delineating all of the characters on screen purely via James McAvoy’s acting. The entire film is anchored by James McAvoy who delivers a tour-de-force performance where he goes to town on the role, alternating between a gay fashion designer, a young boy, a stern matriarch, a history professor and the coldly bespectacled, OCD Dennis. (Although for all it being said that he has twenty-four personalities, we don’t get to see the bulk of them). Split is in many ways M. Night Shyamalan’s most straightforward film so far. It is essentially an abduction and imprisonment thriller focused around the efforts of the girls to escape, along with a parallel plot about the psychiatrist’s sessions with McAvoy. In McAvoy’s weird talk about ‘sacred food’ and transformations into The Beast, you are reminded of the killers in the works of Thomas Harris – the Tooth Fairy and his belief that he is going to transform into the Red Dragon in Manhunter (1986), Red Dragon (2002) and Hannibal (2013-5) and the cross-dressing Jaime Gumb in The Silence of the Lambs (1991). Even within such, Shyamalan is constantly creating something that hints at the fantastic – talk of the mysterious properties of multiple personalities and particularly the ending with the transformed McAvoy climbing around the walls. Shyamalan has a constantly ability in his choice of phrasing or the way scenes are offset from what you expect that constantly keeps us uncertain. Split doesn’t opt for a big conceptual reversal twist, although Shyamalan does give us an odd coda that [PLOT SPOILERS] reveals an uncredited Bruce Willis sitting at the end of a diner bar listening to the story on a news broadcast. This would seem to be the same character that Willis played in Unbreakable. This was later confirmed by Shyamalan who has stated that both Unbreakable and Split would merge in Glass (2019). Audiences reacted divisively to this, variously calling it a lame variant on Shyamalan’s big surprise twist and a clever piece of universe threading continuity. To be fair to Shyamalan, it is not intended as a big conceptual reversal twist but comes more in the way that Marvel Comics movies stuff surprise scenes in during the end credits to tease for forthcoming films. Shyamalan later stated that McAvoy’s character was originally part of the script for Unbreakable and with Glass he revisited the Unbreakable universe, having both Willis and McAvoy’s characters meet up. In the kitchen sink superhero realism that Unbreakable works on, you can see that McAvoy would become a super-villain, something akin to an ordinary everyday version of The Incredible Hulk. Jason Blum and his Blumhouse production company have produced a number of other genre films including:- Hamlet (2000), Paranormal Activity (2007) and sequels, Insidious (2010) and sequel, Tooth Fairy (2010), The Bay (2012), The Lords of Salem (2012), The River (tv series, 2012), Sinister (2012) and sequel, Dark Skies (2013), Oculus (2013), The Purge (2013) and sequels, the tv mini-series Ascension (2014), Creep (2014), Jessabelle (2014), Mercy (2014), Mockingbird (2014), Not Safe for Work (2014), Ouija (2014) and sequel, 13 Sins (2014), The Town That Dreaded Sundown (2014), Unfriended/Cybernatural (2014), Area 51 (2015), The Boy Next Door (2015), Curve (2015), The Gallows (2015), The Gift (2015), Jem and the Holograms (2015), The Lazarus Effect (2015), Martyrs (2015), Visions (2015), The Visit (2015), The Darkness (2016), Hush (2016), Incarnate (2016), The Veil (2016), Viral (2016), Amityville: The Awakening (2017), Get Out (2017), Happy Death Day (2017), Stephanie (2017), Bloodline (2018), Cam (2018), Delirium (2018), Halloween (2018), Seven in Heaven (2018), Truth or Dare (2018), Upgrade (2018), Ma (2019), Relive (2019) and Sweetheart (2019). (Winner for Best Actor (James McAvoy) at this site’s Best of 2017 Awards).